Home | Vinyl Siding How-To | Vinyl siding: Which brand is right for your home? Now that you've decided to install vinyl siding on your home here comes the difficult part: how to choose a particular brand. Actually, it just appears difficult because of all the options that are available, However, once you know what to look for, it should be a fairly easy task. The good news is that it's hard to be wrong -- almost any vinyl siding offered today can be a good choice for your home. 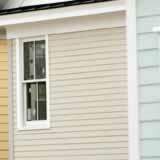 Selecting vinyl siding can be a little different than many of the other products you use every day. When it comes to cars, you may have loyalty to a particular brand. Perhaps your family has always had Fords or you had good luck with your first car which was a Chevrolet. Warranty -- Any good siding company should stand behind their products by providing a lengthy warranty that covers defective material and color fading. Many companies offer a limited lifetime warranty for their better product lines and if you plan on selling your house in the future, choosing a manufacturer that has a transferable warranty might be a good idea. Company longevity -- Everyone enjoys a start-up story until they need the company and it's no longer around. While a few fledgling vinyl siding manufacturers may beat the odds and establish an industry foothold, selecting a company that has been around at least 15 to 20 years might be the safer bet. If you ever want to buy additional siding for a home expansion or remodeling project, there's probably a better chance that the established company will still be in business. Availability -- Just about every vinyl siding manufacturer offers a broad range of styles and colors, but how many are in stock at your local distributor? If you want a Dutch lap in blue but all the distributor has is white in a double 5, you could be in for a lengthy wait and may have to pay some shipping charges. When choosing a siding brand, what's available locally may affect your decision -- it might pay to get some input from the siding distributors in your area. Contractor preference - Most siding contractors will install any type of vinyl cladding, but almost all have a brand preference. If you plan on hiring a contractor, choosing the vinyl siding they most like to work with could possibly qualify you for a price break. At the very least it should get you in their good graces. There are many great vinyl siding brands to choose from and all provide products that should protect your home for a very long time. These tips should help you get started in the right direction.